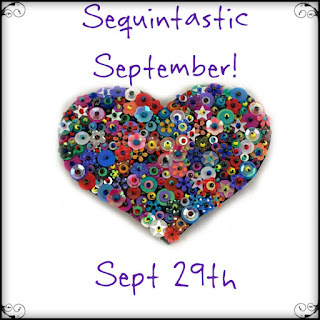 Beading Arts: Sequintastic September blog hop! My friend Sarah, who writes the delightful blog Saturday Sequins, decided to organize a blog hop in order to subvert our thinking to motivate us to think about using sequins in our bead embroidery. Sarah makes bright, happy pieces, and it just wasn't happening for me. Even though I often do make bright happy pieces. Finally, I decided to stop trying to fight it, and gave in to the dark side. That meant that there are an unfortunately small number of sequins on this piece, at least so far. I used a wonderful piece of fabric that I've been hoarding saving for a special occasion. To that I added a fabulous button that I found out in Portland OR when we went out to visit our daughter. 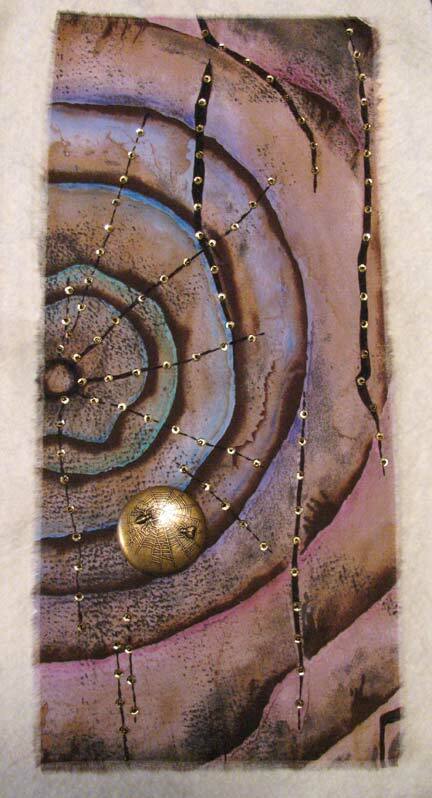 And then I started quilting with embroidery floss, antique gold sequins, and coppery-colored 11/0 seed beads. After I was finished quilting, I added some color to the surface with some Inktense pencils ( Set of 72 ). Love the misty, spooky effect. 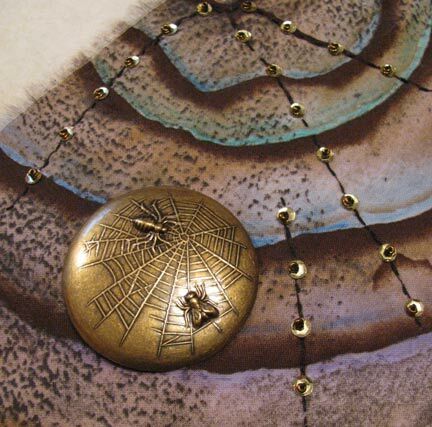 Sometime in the future I will be posting the entire tutorial for this quilted piece on Mixed Media Artist, and I'll make sure to mention it here on Beading Arts for those who are interested in non-wearables. Cyndi, this is fabulous! My inner Goth and Halloween fanatic approves wholeheartedly. I am not a Halloween person at all, but I can't help it, I just love your piece! You totally achieved that spooky effect, and I'm amazed at that button. (I love buttons). Even if you didn't have many sequins, the ones you had set it off perfectly. I so love your creativity! Oh my I love your dark side this is a wonderful wall hanging for this time of year. Beautiful! What a really neat idea to embellish the fabric with the sequins and button. It turned out so well! This looks great -- and now I need those pencils. Gorgeous... This made me long for Halloween more.. lol great job. Fab creation! 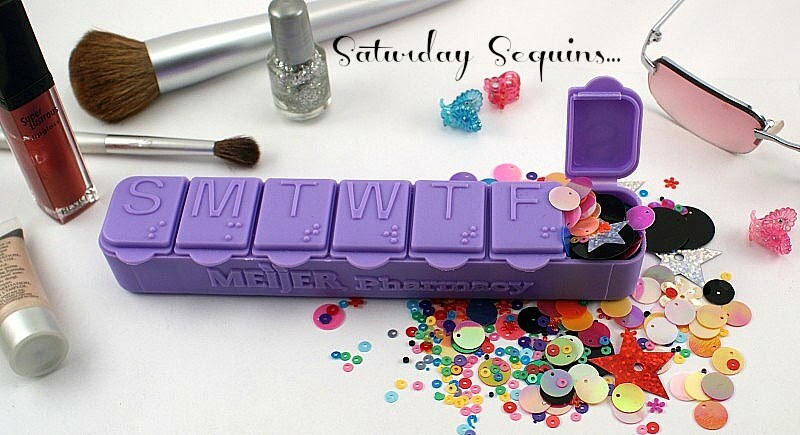 Love the colours and design as well as the sparse but effective use of sequins! Great piece. In my mind sequins = tacky craft projects from my youth. It's unfair and I'm ashamed to admit my prejudgous but . . . . But here,I love them. I am primarily a fiber artist and would love to hear more about this your work. Will definitely check out the pencils. I love the fabric and what you did with it! Dark side, indeed! Lovely evocative piece, all the elements work so well together. LOVE this!! The dark side of sequins!! !